100 MEN AND A GIRL. Hecht-Lancaster Productions announced a two year/seven film distribution deal with United Artists on February 9, 1954. The first three features produced under this contract were all widescreen: APACHE was 1.85; VERA CRUZ was Superscope 2:1 and THE KENTUCKIAN - which was filmed at the same time as MARTY - was CinemaScope 2.55:1. In his auto-biography, Ernest Borgnine talks about Delbert Mann visiting the location of VERA CRUZ in Mexico in order to study the new cinematic techniques. This would have been sometime in April, 1954 and was five months before cameras rolled on his first film as a director. The Director of Photography was Joseph LaShelle , a man who knew his way around a camera. He won the Academy Award in 1945 for his work on LAURA. In the widescreen era, he had previously lensed RIVER OF NO RETURN and four CinemaScope shorts, including the twice Oscar-nominated JET CARRIER. He certainly would have known how to compose MARTY for widescreen while protecting the compositions for 1.37:1. In September 1954, Merle Chamberlin (Director of Projection at MGM) stated, "All of the studios are convinced that the old 3/4 picture is gone and the wider aspect ratio is here to stay." MARTY began production on location in New York. Variety continued to list MARTY as a widescreen production throughout late November when shooting was completed at the Goldwyn studio in Hollywood. 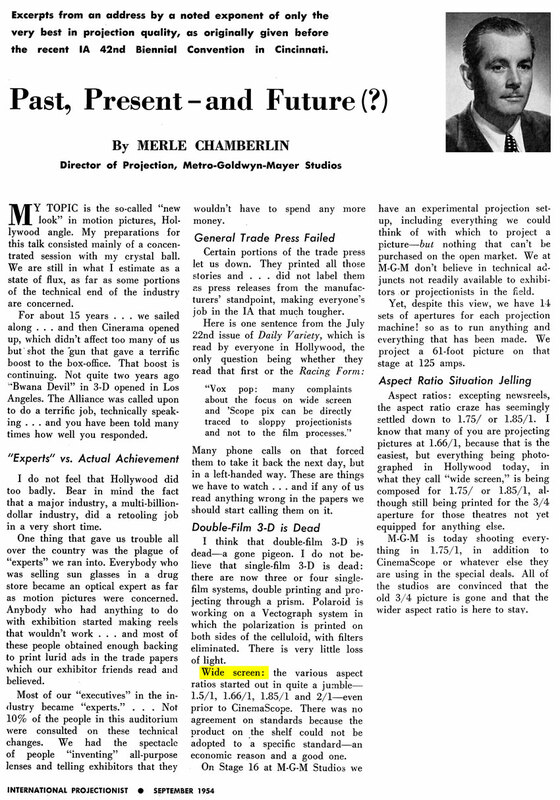 When released in April, 1955, both the Hollywood Reporter - an important daily trade journal read within the industry - and Boxoffice - a bible for exhibitors - list 1.85:1 as the intended ratio for MARTY. The May 13, 1955 opening "on wide screen" at the 3,500-seat Chicago Theatre. Some have speculated that Mann was bucking the system in order to present MARTY on the big screen with the same visual content that had worked so well on television when first broadcast on May 24, 1953. This is not true. After Mann visited the VERY CRUZ location, the goal was to expand and adapt the subject matter to the big screen. Film Bulletin pointed out this fact in a July 11, 1955 article discussing the disappointing boxoffice performance of DAVY CROCKETT, another big screen production recently taken from TV. Mann and LaShelle used a lot of low-key lighting and with the reduced aperture openings for flat widescreen projection, this did not translate well to the big screen. The timing problem should have been corrected in the lab when striking the release prints. All Contents © 2011-2019 3-D Film Archive, LLC. All Rights Reserved.